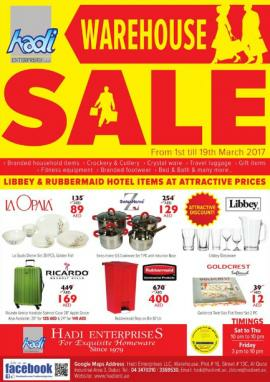 Home Style - One of the biggest furniture & homeware warehouse sale is back. Starting from 29th November, 2018. 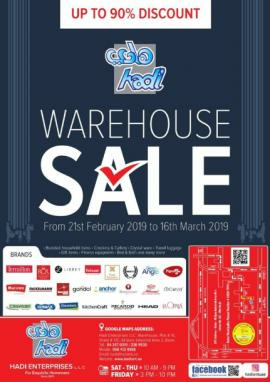 Location: Home Style Warehouse, behind Sharjah City Centre. Home Style - Luggage Carnival. Offer valid till 30th July. 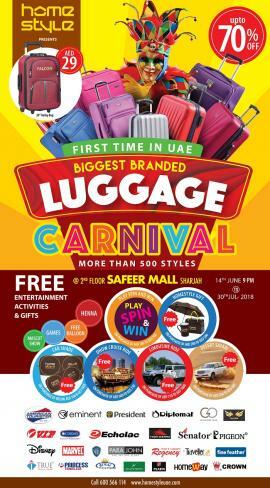 Venue : Safeer Mall Sharjah. 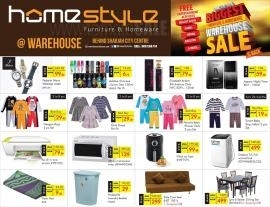 Home Style - The Biggest Ramadan Tent Discount. 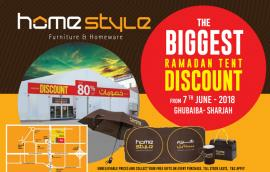 Home Style Tent Sale at Ghubaiba branch only. Offer valid till stock last. 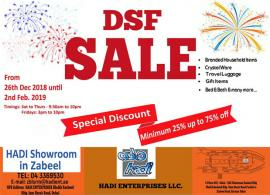 Hadi Enterprises - DSF Part Sale at Hadi showroom, Karama. 26th December onwards. 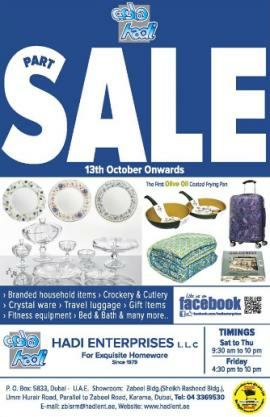 Hadi Enterprises - Warehouse Sale. From 7th till 23rd December. Address :Street #13,16, Al Quoz 3, Behind Al Qouz Mall - Dubai. Working Hours : Sat to Thursday 10 AM to 10 PM, Friday 3 PM to 10 PM. 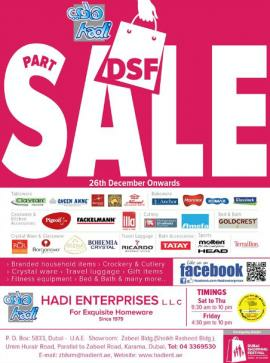 Hadi Enterprises - Part Sale. 13th October onwards. 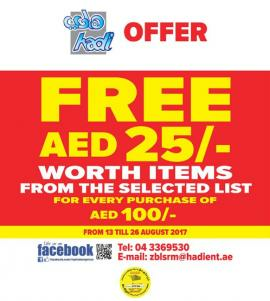 Hadi Enterprises - Free AED 25 worth items from the selected list for every purchase of AED 100. Offer valid from 13 till 26 August 2017. 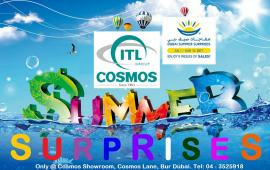 COSMOS - Summer Surprises. Only at Cosmos Showroom, Cosmos Lane, Bur Dubai. 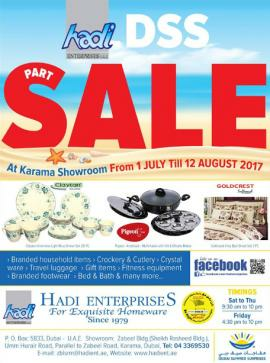 Hadi Enterprises - DSS Part SALE at Karama showroom from 1 July till 12 August 2017. 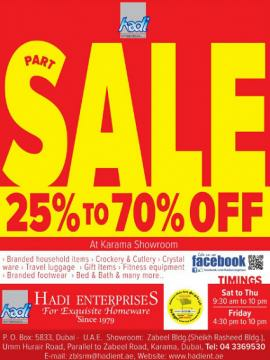 Hadi Enterprises - Part SALE 25% to 70% off at Karama Showroom. 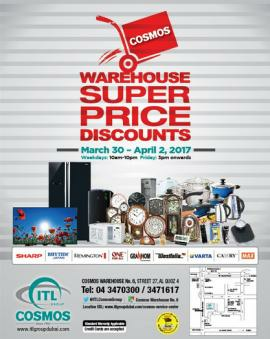 COSMOS warehouse super price discounts. March 30 - April 2, 2017. Weekdays: 10am-10pm. Friday: 3pm onwards. 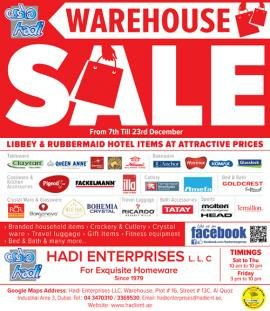 Hadi Enterprises - Warehouse Sale. From 1st till 19th March 2017. 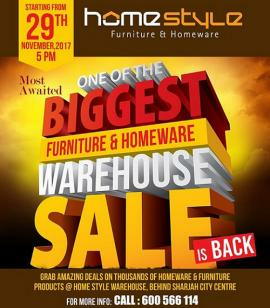 Home Style - The most awaited biggest furniture & warehouse sale. 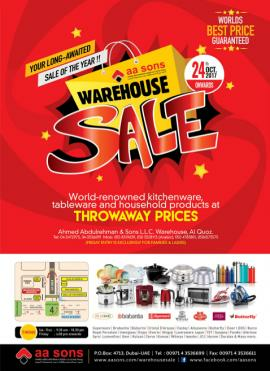 Grab the amazing deals on thousands of homeware & furniture products @ Home Style warehouse behind Sharjah City Centre. 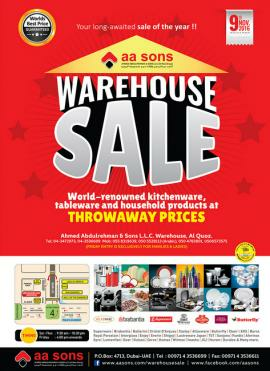 AA Sons - Warehouse Sale. 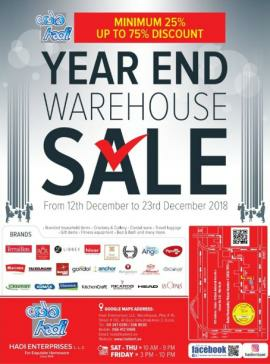 Your long-awaited sale of the year. TomatoSALE brings to you list of information about all the offers, deals, discounts, sale running in various warehouses across Dubai, Abu Dhabi, Sharjah and all over UAE. Browse city wise, brand wise or item wise to know about specific offers. 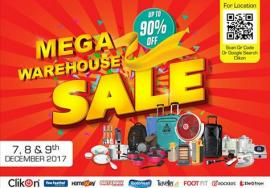 Be the first one to know about these warehouse sale and offers via TomatoSALE. 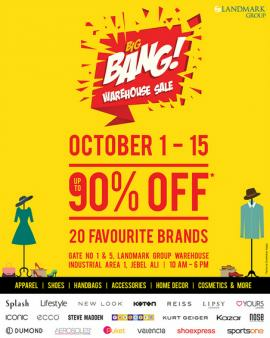 Get the best deals, offers, discounts, sale happening in all warehouses in Dubai, Abu Dhabi, Sharjah and all over UAE. 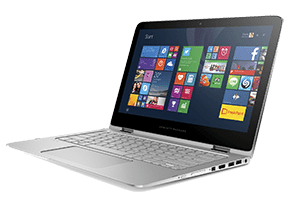 Get offer listings for apparel, footwear, electronics, home decor items, accessories, utility products and much more at unbelievable prices. Browse through TomatoSALE to get all information in a jiffy. Get an exhaustive list of offers from various stores in Dubai, Abu Dhabi, Sharjah and all over UAE. Be the first one to know about these sale and offers and get them before offers are closed. One destination for all shopping offers for malls, stores, shopping centers anywhere in Dubai, Abu Dhabi, Sharjah and all over UAE.